You know those weekends where everything goes terribly, horribly wrong? People don’t show up. Traffic is terrible so the people who do show up are late. The restaurant you picked is full. The back-up restaurant has lousy service and bad food. Everyone wants to do different things so you end up spending half an hour standing in parking lot debating what to do next and you end up all going in different directions anyway. The ONLY museum you want to go to is closed and you ended up just staring at it before you wander away to the nearest Starbucks. Then you consume too much food and take too little insulin, which leaves your blood sugar hovering near the moon and you’re even more pissed. This, however, was not one of those weekends. Honestly, everything about this weekend went exactly the way it was supposed to, which makes me the happiest person in the universe. On Saturday morning, I drove down to Philadelphia to have lunch with some of the coolest, craziest cats in the diabetes community. 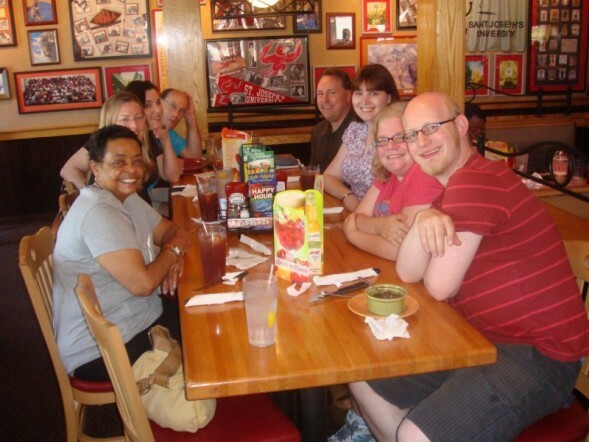 I arrived at a nearly empty Applebee’s, which was great because it made getting a table for nine people very easy! Soon after, Gary Scheiner arrived, followed by Emily, a friend of Kelly’s, who is studying to be a nurse and is interested in learning more about living with diabetes. So of course she was welcomed! Kelly arrived shortly after that. Then Scott and Joe arrived, along with Hannah and her husband, Matt, followed by Betty. Getting a group of diabetics (and a handful of T3s) is always a recipe for lively discussion. We spent over three hours at Applebee’s talking about everything from health professionals who irritate us to misconceptions that work to our advantage (using diabetes to get a table faster or getting a handicap pass at an amusement park) to Kelly and Scott sharing their experiences of growing up in the early 80s with diabetes (oh the horrors!). We laughed, we debated, and we took pictures! (from the lower left-hand corner going clockwise) Betty, Emily, Kelly, Gary, Scott, me, Hannah and Matt. After lunch, we all split up in various directions. Hannah, Kelly and I went back to her apartment in South Philly after making plans to meet Scott and Joe for dinner on South Street. We wandered around South Street for a bit, poking our heads into some of the cheap jewelry stores, killing time until Scott and Joe arrived. 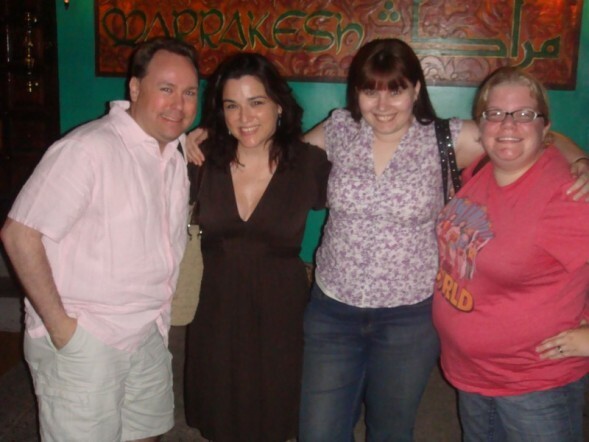 Around seven o’clock, we walked over to the Marrakesh, the Morrocan restaurant we were supposed to meet at. I tried to open the door, but it was locked. Kelly rang the doorbell – no answer. We stood across the street, plotting a way to break into the restaurant (I suggested climbing through the upstairs window), when we saw Scott and Joe come around the corner. Joe went up to the door and knocked. A lady opened the door. Apparently they just didn’t like us. Morrocan food is amazing but it was a ton of food. A seven course meal that included chicken, lamb, salad, couscous, fruit and baklava – all accompanied by their pita bread – had us eating more carbohydrates than I typically eat in an entire day! We shared more experiences growing up with diabetes. But it wasn’t all diabetes, all the time! We were also thoroughly entertained when the bellydancer came around. After dinner, we waddled back to Kelly’s apartment through the Italian Market. We were so bloated with food that we felt like we were pregnant. Kelly joked that we had “food babies.” When we got back to the apartment, we quickly looked up directions to the studio where Hannah’s husband was recording with his band. We hoped in our car and made our way back to Ardmore, just a couple miles away from where we had lunch and a stone’s throw from Gary’s office (we waved as we past it). As we drove through the mean streets of Ardmore, which involved us passing our turn not once, but twice, we eventually found the studio down a little driveway off a mostly unpaved road. It wasn’t exactly the easiest place to get to, but having those few extra hours with Hannah was so much fun. Kelly and I slept in on Sunday and after a quick breakfast, we went to check out Independence Hall, which is one of the last few historical landmarks that I hadn’t been to on the East Coast. When we arrived, we stumbled upon a sign that said “NO MORE TICKETS ON SALE TODAY” and we were immediately crestfallen. I was thwarted once again. But then! A man appeared! Okay, he didn’t appear, he was the security officer and was standing there the entire time. He asked us when we were leaving. Kelly replied, “She’s leaving today.” A woman was standing next to him and said that some people didn’t show up, ripped off two tickets from her little booklet and handed them to us. It was obviously meant to be. I left later that afternoon, quickly stopping by Bank of America and a gas station (yes, I pumped my own gas and this time I didn’t even ask for help!). Traffic was a bit nasty so I didn’t get home until nearly four hours after leaving Kelly’s, but I also stopped at one of the service stations so it wasn’t completely traffic’s fault. I was still home before eight, which meant I had time to upload all the pictures and watch Army Wives. ← 404 Error. Not Found. Oh wow! That looks like such a good time!!! I am jealous but very happy for you all and glad it went well. I’m so sad that I missed out. I’m glad you guys enjoyed the meet up, sounds like a wonderful weekend. You watch Army Wives?! Everyone I know thinks it’s the stupidest show ever…but I love it. Thanks for the pictures. It’s great to see everyone having a wonderful time! That looks like a fantastic time. Fun group. http://www.bentpage.wordpress.com. That looks like a fabulous group of people and certainly a great time! I’m glad everything worked out so well. BTW, who usually pumps your gas? Jillian: I love Army Wives! I wasn’t into it the first season, but now I think it’s one of the best shows on TV. Mandy: Uh, gas station attendants? Oregon and New Jersey are the only 2 states in the union where it is illegal to pump your own gas. I’ve only done it twice, both happened to be in Pennsylvania. Looks like a great time! One of these days I’ll get to hang with you all too I hope! Can’t wait till the next get together! Allison you’re a quick study when it comes to pumping gas. 🙂 I enjoyed my second meetup as much as the first one. This sleepy diabetic literally rocked out all day Saturday. I got up at 9, ran errands, hung out with you guys all afternoon, and after we went to the studio, I stayed awake there. My head finally hit my pillow around 6am on Sunday! You guys look like you all had such a great time. Thanks for writing about it and posting the pictures, too, Allison.